Architects, builders, and owners have created a revolution in the way new buildings are planned and constructed. This revolution has generated awareness in the roofing industry to reveal a sustainable roofing system for commercial, industrial and residential applications. A sustainable system that doesn’t leak, supports energy conservation, and warrants the confidence of the building owner, engineer and architect. 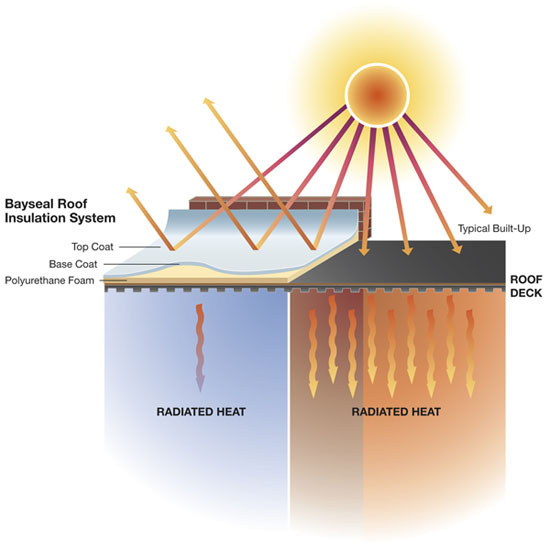 That system is Bayseal'” Spray Polyurethane Foam (SPF) insulation Roofing System manufactured by Bayer Material Science. BayseaI is a rigid, closed-cell plastic created by a combination of two liquid components, which react in seconds and can be walked on in a matter of minutes. These roofs provide high compressive strengths that increase durability endure foot traffic, and resist impact and storm damage. 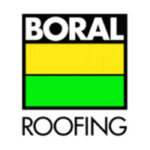 The life cycle cost of a roof is defined as the present value of all the costs associated with the roof from initial installation until reroof. Sustainable roof systems are becoming increasingly important. Sustainable systems preserve natural resources, reduce landfill waste and provide maximum life cycle cost efficiency. Bayseal’s tenacious ability to adhere to most surfaces provides a watertight monolithic seal around penetrations, up parapet walls, and other parts of the structure without the use of mechanical flashing, in most cases. Polyurethane foam can be sprayed in various thicknesses to create positive drainage and eliminate ponding water. Ponding water is the principal indication of inadequate drainage, a frequent cause of roof leaks. Roof leaks accelerate roof deterioration. After the SPF has been applied to the proper thickness and finish specifications, a protective layer of elastomeric coating is added. This protective layer produces a UV resistant and sustainable surface. solar radiation, a roof system can control both the heat loss and heat gain to reduce the roof temperature extremes, improve the durability of the total roof system, and reduce energy used to cool and heat the structure. Many large companies and institutions have documented energy savings from the use of SPF roofing systems. Texas A&M calculated the energy consumption of its buildings before and after the application of SPF roofing systems. According to the study of more than eight million square feet of SPF roofing, energy savings paid for the cost of Texas A&M’s SPF roof applications in three to four years. Wind uplift resistance is the primary cause of wind damage. A partial vacuum is created by wind blowing over the edge of the roof. Nature tries to neutralize the low-pressure area by bringing in air from a higher-pressure area, usually from inside the building This air pushes up on the bottom side of the roof assembly and, over time, loosens fasteners and breaks the adhesion making the roof susceptible to damage from the next moderate or strong wind. Recent wind-uplift tests performed by Underwriters Laboratories have shown that polyurethane foam actually enhances the wind-uplift resistance of the substrate. Because polyurethane foam roofs are not “blown off” during periods of high winds or severe weather, structures with polyurethane foam roofs can be repaired and put back into service much faster than buildings with conventional roofing systems. A leading cause of premature roofing failure is excessive building movement from expansion and contraction. Spray foam’s effective insulation properties and structural reinforcement substantially reduce building movement and extend the roof life of the building. Products, No Leak and Five/Ten Year BayseaI Roofing System Warranties are available, coordinated, and priced at the time of specification by a Bayer Material Science Representative. We love Flat Roofs! Give us a call today or click here and we will contact you immediately.